Lo and behold, it’s another Mixology Monday! This 35th incarnation is being hosted by The Scribe at A Mixed Dram, and he bids us: Broaden Your Horizons. Try a new base spirit, a new technique, anything, just as long as it’s something new for you. The Scribe is apparently precognitive, because the base spirit he gave as an example, tequila, is one that’s fairly foreign to me. Just last week I put up my first post that included tequila. In that post, I included a drink that was new to me, the Witch’s Kiss, but not an invention of my own. Because I’ve never tried to create a tequila cocktail. Well, that’s not exactly true. I did once create a cocktail that included tequila. After trying the Piscadora, and reading that tequila went well with creme de cassis, I tried mixing tequila, lime juice, crème de cassis, and ginger beer. It was fantastic! I was so excited to share this new drink. Luckily, I did a little research before posting about it, and turns out, I’d gone full circle. The Piscadora was probably inspired by the Diablo, a well-known drink. Since then, I haven’t had the heart or incentive to experiment with tequila. Thanks to MxMo, now I do! At first, I thought I might try to work on what I knew went well with tequila. If orange liqueur mixed well for a margarita, maybe apricot liqueur would also work. I tried both Orchard Apricot and Marie Brizard’s Apry, and both were total duds. The apricot flavor and the tequila just didn’t blend well, and in fact turned rather unpleasant in my mouth. I had promised myself I would not resort to crème de cassis, but I wanted something with a strong flavor to take on the tequila. That’s when I thought I might try Cherry Heering. Heering can quickly dominate a drink, but in small quantities, brings a lot of rich flavor. To add some depth, I added some Licor 43 (Quarenta y Tres). To make it a little drier and less potent, I added some dry vermouth. And finally added some Angostura orange bitters to add more balance and some brightness on the nose. I was very satisfied with the result. Stir over ice and strain into cocktail glass. Garnish with brandied cherries. The tequila is still present in this cocktail, but the Cherry Heering and Licor 43 bring a nice roundness and softness to it, which the vermouth keeps it from being too sweet. As for the name, Paquimé is an archaeological zone in Chihuahua, Mexico. It’s also the name of a cooperative that is picking cherries that are being grown in Chihuahua. So in honor of them, I name the drink. A big thanks to the Scribe for suggesting that we broaden our horizons. It’s always fun to be encourage to expand my repetoir, and this experiment taught me a lot about how to match flavors. Be sure to check out A Mixed Dram for the round-up post! I have recently learned I am allergic to all citrus, and to pineapples. This is a pretty huge kink in my mixological options. I would appreciate any suggests you have for interesting cocktails that don’t require these items. I presume that means no citrus based liqueurs, as well? Hopefully you didn’t get your heart set on tiki drinks! This is an interesting cocktail Stevi. 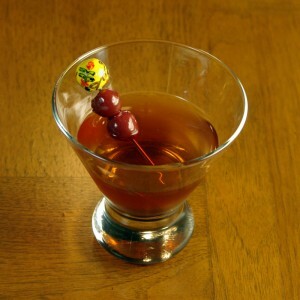 Fun garnish, reminds me of 3 dots and a dash.What have you wrapped around the top cherry? Its fun. Sounds great, Stevi. Both Licor Cuarenta y Tres and Cherry Heering mix well with tequila. We’re going to try your recipe first, then see how it works with añejo tequila. Cheers! That’s actually an enameled bead on the top of the cocktail pick! Be sure to report back on your findings!